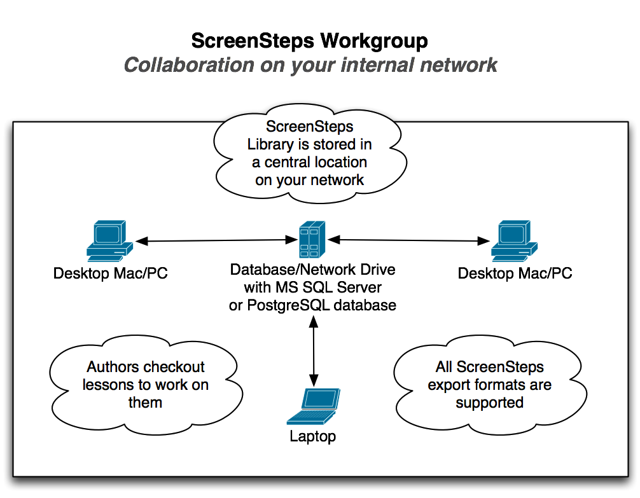 ScreenSteps Workgroup is a great collaboration solution if your team is all located on the same internal network. We originally created ScreenSteps Workgroup for our corporate, government, and educational customers who needed a way to collaborate on ScreenSteps manuals inside of their own network or firewall. ScreenSteps Workgroup uses the same interface for creating and editing documentation as ScreenSteps Desktop. But, instead of your ScreenSteps library file being stored on your local computer, the database and media files are installed in a central location on your own internal network. Each user of ScreenSteps Workgroup can browse and edit lessons in your library. When a lesson is opened for editing, it is automatically locked so that no other user can edit the lesson at the same time. This prevents your authors from running creating conflicts by editing the same lesson at the same time. Because everything is stored in a central location your authors never have to chase down the original ScreenSteps files when they need to update a document. Another advantage is that you can share your PDF, HTML and Word templates as part of the library so that all of the documents you export from ScreenSteps have a consistent look. With ScreenSteps Workgroup you can create multiple libraries on your network. With the ScreenSteps Workgroup Admin Tool you can then assign specific users to each library. The ScreenSteps Workgroup user license is also very flexible. The ScreenSteps Workgroup license is a concurrent user license. You can install the desktop client on as many computers as you like. You only pay for the number of users that are using ScreenSteps Workgroup at the same time. This gives you a lot of flexibility when you aren&apos;t exactly sure how many people will be contributing to your documentation. Everyone needs to be on the same internal network. ScreenSteps Workgroup won’t work with remote workers. A VPN connection generally won\u2019t be good enough unless it is very fast. ScreenSteps moves a lot of image data around. If you have a slow VPN connection you will find the experience to be frustrating. You will need to be able to setup a shared network drive as well as a Microsoft SQL server or PostgreSQL database on your network (we have detailed instructions about how to do this). We offer a free trial for ScreenSteps Workgroup. Just let us know how many people you want to test it with and we can get you a trial key and installation instructions.